President Trump holds a signed memorandum on intellectual property tariffs on high-tech goods from China. China's threat to retaliate against U.S. tariffs by imposing an additional 25 percent fee on American car imports would have a bigger impact on Germany's Daimler and BMW than on Detroit automakers, according to analysts at Evercore ISI. "This is essentially a tax on southern German automakers, specifically BMW and Mercedes SUVs, which are built in the U.S. and exported to China," said Arndt Ellinghorst, an analyst with Evercore ISI. While Elon Musk's Tesla will be hard hit, other U.S. automakers have already shifted production to China, and export far fewer cars to the world's biggest market. Germany's Volkswagen makes most of its Chinese-sold cars locally. BMW is the largest vehicle exporter from the United States in terms of value. The automaker has its largest global factory in Spartanburg, South Carolina and faces a $965 million impact from tariffs, Evercore ISI said. BMW builds its X3, X4, X5, X6 and X7 sports utility vehicles in Spartanburg, and the trade dispute will only add pressure to move production of volume sellers such as the X5 to markets outside the U.S, a senior BMW source said. But any switch from one factory to another costs millions of euros, takes months to implement, and is taken with a long-term view, BMW board member Peter Schwarzenbauer said last month. “We have to make decisions, like about factories in Spartanburg or factories in Mexico, which are based on a horizon of 20 to 30 years. If we were to change our strategy whenever a tweet comes out, we would get crazy,” he told Reuters. Daimler, which has a Mercedes-Benz factory in Vance, Alabama, is exposed to a $765 million hit, Evercore ISI said. BMW and Daimler will ship just over 100,000 vehicles to China from the U.S. this year comprising about 64,000 BMW SUVs and 51,000 vehicles from Daimler including the Mercedes GLE, GLS and R class, Evercore estimates -- almost $7 billion worth of goods. 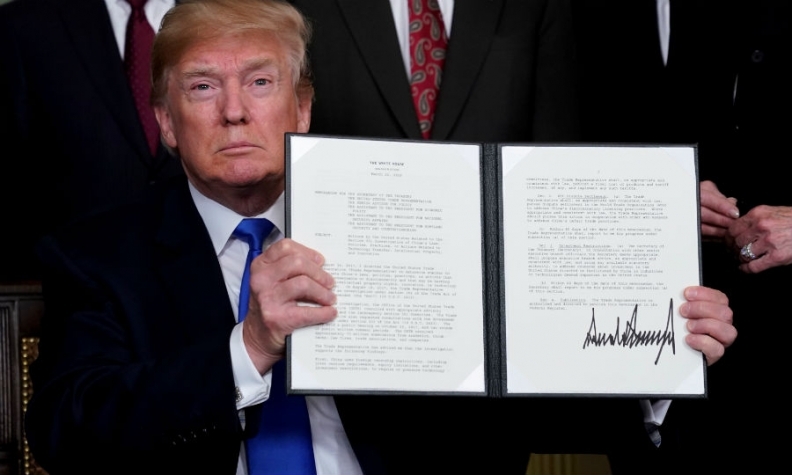 "This is a prime example of the unintended consequences of a trade war," Ellinghorst wrote in a note. "Global trade, especially in the auto industry, is a system that has grown over decades and abrupt distortions can have meaningful negative implications." President Donald Trump's administration on Tuesday raised the stakes in a growing trade showdown with China by proposing 25 percent tariffs on some 1,300 industrial technology, transport and medical products to try to force changes in Beijing's intellectual property practices.